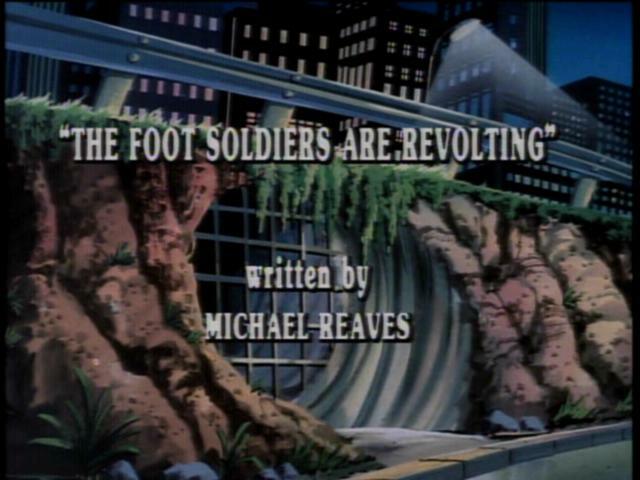 After Bebop and Rocksteady blow another assignment, Shredder fires them and decides to replace them with an intelligent Foot Soldier named Alpha One. A computer interruption caused by Bebop and Rocksteady causes the main computer to malfunction while Krang is programming Alpha One. The end result is Alpha One comes out more intelligent than Krang and Shredder put together. Alpha One decides he does not want to work for Krang and Shredder, so he sends them out into Dimension X space in a life pod. Alpha One starts to do the same with Bebop and Rocksteady but they tell him where he can find a wave modulator. Thinking that this will be helpful if he wants to rule the world, A 1 decides to keep Bebop and Rocksteady with him. His plan is to transport all the humans to Dimension X so he and his robots will have control of the Earth. The Turtles are looking for the wave modulator in the sewer. Just as they find it, Alpha One shows up with his soldiers, Bebop and Rocksteady. The Turtles try to stop him from taking the modulator, but fail. Alpha One returns to Dimension X, but leaves Bebop and Rocksteady in the sewer. Bebop and Rocksteady and the Turtles decide to work together to try and stop Alpha One. When the Turtles go to the surface, they discover that Alpha One is on Earth with a Dimensional Displacement Device which he is using to transport all organic life to Dimension X. Meanwhile, back in Dimension X, Krang and Shredder manage to find their way back to the Technodrome. When they get there, they discover all the people that Alpha One has transported. They immediately start transporting all of them back to Earth. Alpha One sees the people coming back through the portal and gets distracted because he doesn’t know what’s happening. This distraction allows the Turtles to take the wave modulator out of the Dimnsional Displacement Device. The Turtles turn the device against Alpha One transporting him to an unknown dimension. The Turtles then use the Device to transport Bebop and Rocksteady back to Dimension X where they belong.